The shootings at an elementary school in Newtown, Conn. on Friday have drawn widespread public interest. A weekend survey finds that 57% of Americans say they followed news about the tragedy there very closely. That is higher than interest in the shootings at an Aurora, Colo. movie theater in July (49% very closely), though not as great as interest in the Columbine shootings in 1999 (68%). The survey by the Pew Research Center for the People & the Press, conducted Dec. 14-16 among 746 adults, finds the public is evenly divided over whether the Newtown shootings reflect broader problems in Americans society (47%) or are just the acts of troubled individuals (44%). By contrast, clear majorities said that both the Aurora shootings, as well as the shootings in Tucson, Ariz. in Jan. 2011, were just the isolated acts of troubled individuals; 67% said that after the Aurora shootings at a movie theater and 58% said that after the Tucson shootings, which killed six and left former Rep. Gabrielle Giffords seriously wounded. Opinions today are comparable to reactions to the shootings on the campus of Virginia Tech University in April 2007. Most parents are talking with their children about the massacre at Sandy Hook Elementary School, according to a separate survey of more than 750 adults with children at home, conducted Dec. 14-17, using Google Consumer Surveys. About half (53%) of all the parents who participated in the survey, including 71% of those with younger children, say they are restricting how much news coverage of the tragedy their children watch. Isolated Acts or Indicative of Broader Problems? Women, by 54% to 37%, say that Friday’s shootings at the elementary school reflect broader problems in American society. 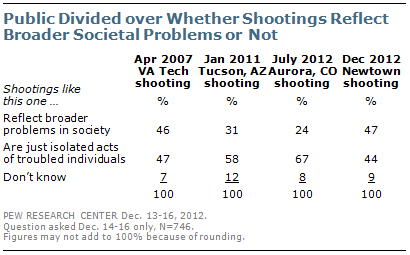 Men express the opposite view: 51% say that shootings like this are just the isolated acts of troubled individuals. College graduates (54%) are more likely than those with no more than a high school education (42%) to say that the massacre reflects broader societal problems. There also are partisan differences in reactions to the tragedy: Democrats, by 54% to 39%, say the shootings reflect broader societal problems. Republicans are divided, with 49% saying such incidents are the acts of troubled individuals, while 45% say they reflect broader problems. People who have followed news about the shootings very closely are more likely than those who have not to say that they represent broader problems in society (51% vs. 40%). A separate survey of more than 750 internet users with school-age children in the household, conducted Dec. 14-17, 2012 using Google Consumer Surveys finds that most are talking with their children about Friday’s shootings. Fully 62% of those with school age children have talked with their children about the shootings either a lot (20%) or some (42%), while 23% have not discussed the events with their children at all. 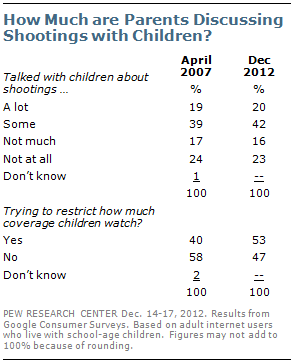 About half (53%) of parents say they have restricted how much coverage of the shootings their children watch. In a 2007 telephone survey, which was conducted shortly after the Virginia Tech shootings, 40% said they were restricting how much coverage their children watched. Parents of elementary school-age children are discussing the recent events with their children far less than parents of older children. Only about half (48%) of parents with elementary school-age children have talked about the shootings with their children at least some, compared with 72% of parents only with children in 6th-12th grade. Fully 71% of parents with children in elementary school are trying to restrict how much coverage of the events their children watch, compared with only 36% of parents with older children. Six-in-ten parents (60%) with both elementary school-age and older children are restricting how much coverage their children watch. Nearly six-in-ten (57%) say they followed news about the Newtown shooting very closely, making it by far the public’s top story last week. 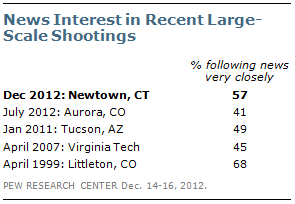 News interest in the Newtown shooting is higher than for other recent gun tragedies, including shootings in Aurora, Colo. (41% very closely), Tucson, Ariz. (49% very closely), and Virginia Tech (45% very closely). In April 1999, somewhat more followed news about shootings at Columbine High School in Littleton, Colo. very closely (68%).